Strong Little Legs | Are You Zhazha? The Strong Legs Run in Atlanta was awesome for us because it was held at the home of the Braves, Turner Field, and it was the first time we all took part in a race as a family. 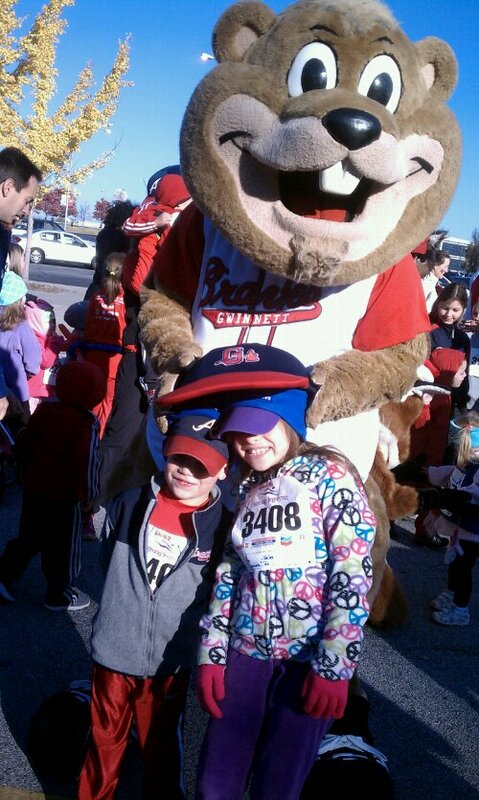 Andrew ran the 5K, I signed up for the 2K and the kids had fun in the Mascot Trot, a short dash with some of the area’s most popular mascots (including their favorite, Chopper from the Gwinnett Braves). They liked the Trot but were disappointed about how short it was. Since the 2K followed it, all three of them came along with me for fun. Nate was pumped. When we finally turned the corner for the finish line, I asked Nia if she felt like running again and we picked up the pace. Andrew and Nate were there to cheer us on and Nate even ran with us (well, it was more like sprinted ahead of us) through the finish line again. I think he would’ve liked to keep finishing, sprinting past everyone like he was the winner. Andrew tracked Nate’s time on RunKeeper and it said he finished in 11 minutes. He thinks Nate could’ve done it in 10 if he didn’t stop that one time and if Andrew didn’t have to keep slowing him down for pacing reasons. We all enjoyed our Strong Legs morning – each of us walking away with t-shirts of our own and a fun family memory that we plan to do again. We’ve already picked out some fancy (fast) running pants for Nate and Nia and Andrew has already chosen our next race.